Jeffrey looks like that, not his defense lawyer. I should have been more clear. Story-sender Thomas B. asks whether this tattoo would be admissible at trial, and I think the answer is no. The fact that you like the word "murder" does not tend to prove you actually commit murders. In fact, you have a First Amendment right to go around saying (or displaying) "murder" all you want, except probably if someone has just asked you "should we murder or not murder this person?" So it is not relevant, but for what are probably obvious reasons it is pretty likely to prejudice a jury. So it would be out under Federal Rule 403, at least. What seems to be the Kansas equivalent, though, says that a judge can exclude evidence if "its probative value is substantially outweighed by the risk that its admission will unfairly and harmfully surprise a party who has not had reasonable opportunity to anticipate that such evidence would be offered." I don't think it has any probative value, but it's also hard to see how Jeffrey should not reasonably have anticipated his neck tattoo might be an issue. I'd be willing to bet that Kansas interprets this rule in a way similar to the federal rule, though. Even if it doesn't, there are other reasons your "murder" tattoo should stay out. Arguably this would violate the rule against self-incrimination, but it might also violate the rule against offering evidence of "bad character" to prove guilt. Actual criminal-defense attorneys could probably come up with many other ideas. And, in fact, the prosecution in the case is not arguing that it should be admissible. Jeffrey's problem with this particular inadmissible evidence, though, is that it is permanently attached to his skin. That's why his lawyer has also asked that a tattoo artist be allowed to cover up or try to remove the tattoo before trial starts on April 28. The State objects to this plan, apparently because it would prefer he wear a turtleneck or something of the kind. At least, the State's argument is (1) it doesn't want to transport the suspect to the tattoo artist, probably for security reasons, (2) and the tattoo artist can't come to him because Kansas law does not allow tattoo artists to "practice at any location other than a licensed facility." I seriously doubt the State really cares about No. 2, which is why I like my turtleneck theory better. The dilemma is apparently to be resolved in a pre-trial hearing today, so we shall see. The somewhat similar tattoo case was that of Anthony Garcia, who was convicted in 2011 of a murder committed four years previously. He didn't have a tattoo of the word "murder," but he did have a tattoo that depicted a murder crime scene in sufficient detail that a detective who later saw it in an unrelated mugshot instantly recognized it. 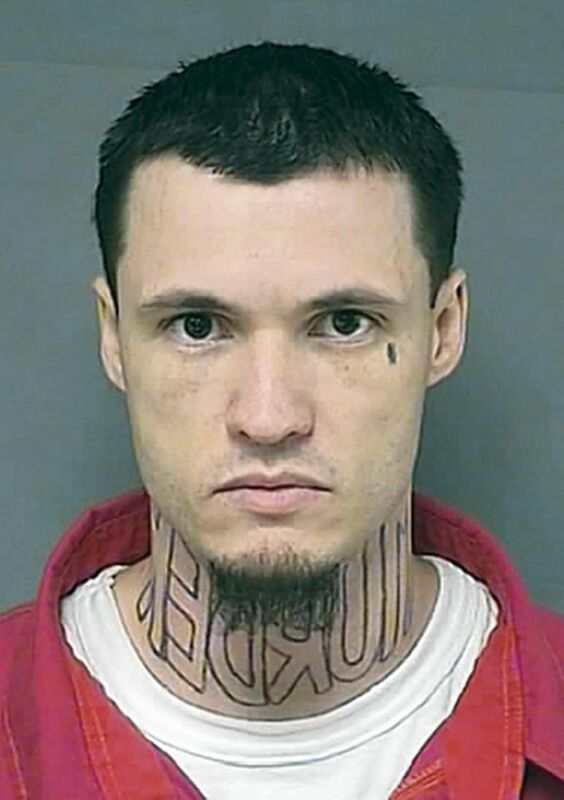 "Guy With Murder Scene Tattooed on His Chest Convicted" (July 24, 2013). I'm not sure whether the tattoo itself was admitted, and I think it could have been given the significantly higher probative value. But it wouldn't have mattered, because an undercover cop got Garcia to brag about the murder on tape. Oh, and here's a previous "client needs a makeover" case complete with the lawyer's amusing Photoshop rendering of what his prettified client might look like. Guess I have more stupid-tattoo tales than I thought.